The images in this collection are selections from the photographic archives of The State Media Company, which are stored at Richland Library. This digital collection will continue to grow as more historic photographs are digitized. A finding aid for the archive is available. 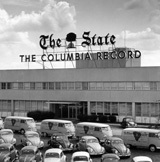 The photographs in the archive date from 1955 to 2002 and were taken by staff photographers for The State and The Columbia Record newspapers. The Columbia Record was the evening paper for Columbia and was published from 1913 to 1988. The State was first published in 1891 and remains the leading daily newspaper for the city. Please note that the images in this collection are for personal and educational use only and remain under copyright of The State Media Company. Contact the Walker Local and Family History Center at Richland Library for questions about the use of this collection.